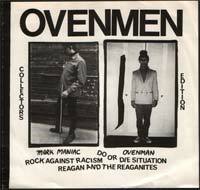 Searching Google gives you nothing on Ovenmen. This band has been a mystery to me since 2003 when I first stumbled upon it in Copenhagen at a record shop named “Route 66”. Apparently this was a one man project cause the adress on the back reads: “Louis(Ovenman) Lopes, 144 Broadway 6thfl, Williamsburg N.Y 11211” with the help of “Mark Maniac” on keyboards, rythm box and vocals. Another note on the back of the sleeve he thanks some former members who was in the band in Boston between 77-78 then called “Ovenman And The Roasters”. Great stuff! I’m lovin’ this one. Good score! WOW. that is an awesome backwoods mystery record. and the production….PERFECT…. I’m glad to see someone noticed this record. It turns up in cheap bins around NYC from time to time.